It’s like a bag within a bag. The independently suspended weatherproof liner freely floats within the outer shell eliminating seams exposed to the outside elements. Your cargo is safe from rain, snow, mud, and most anything else this cruel world can sling at you. 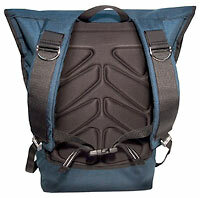 This weatherproofing is a feature of all messenger bags produced by Chrome, but the Messenger Backpack comes with two cushioned shoulder straps and a molded back panel, so you carry it like a backpack. Like Starbucks, Chrome gives a different name for each size, for no apparent reason: Dually (small), Ranchero (midsize), and Backbone (the largest, at 21 in. x 20 in. x 7 in.). The shell is made of Cordura nylon, and the liner is an eighteen-ounce truck tarp liner. We’ve heard of that material in bags before: After you’ve used one of these for a while, you might be able to turn it inside out and sell it as a Freitag. This Chrome case needs to be well-loaded for its broad shoulder straps to hang correctly. The fit is different from any previous pack or rucksack I’ve ever used, and I’m gradually getting used to it. Weight distribution is fine, assisted by a molded back panel and ribcage straps, and my orange presence can be spotted from a hundred miles in the sky in case of emergency. Chrome calls their messenger backpacks “the next step in messenger bag evolution,” which sounds kinda funny to us. Why? Because for many potential purchasers of man purses, the main benefits of a messenger bag (over, say, another type of satchel) is that they provide some sort of authenticity to their male carriers — a pedigree that’s used as cultural cover for the not-entirely-socially-acceptable habit of carrying a handbag. Once a messenger bag evolves beyond the point that allows a casual observer to identify it effortlessly, a wearer might be seen for what he truly is: a man carrying a big floppy purse. In an ideal world, that would be fine. In New York City, even. But sadly, not everywhere. Yet. This entry was posted on Tuesday, June 20th, 2006 at 9:41 pm	and is filed under Backpacks, Commentary, Courier Bags, Man Bags, Manufacturers, Messenger Bags, Public Image. You can follow any responses to this entry through the RSS 2.0 feed. You can leave a response, or trackback from your own site.